Ellie delivers an exceptional lesson experience and ranks in the top 15% of our teachers nationwide. Expert in opera and choral singing. 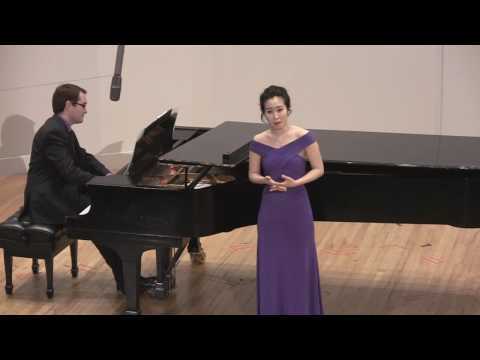 Soprano Ellie Yeonjung K., completed her Master's of Music degree at the Manhattan School of Music in New York studying under Joan Patenaude-Yarnell. Ellie's operatic appearances include Barbarina in Le Nozze di Figaro with the Dell'arte Opera Emsemble and Lucy in Menotti's TheTelephone at the Korea National Theater. She was recognized with "great critical acclaim" by Opera News online for the role of Rita in Donizetti's Rita with the Martina Arroyo Foundation. Other repertoire include Pamina in Die Zauberflöte, Sophie in Massenet's Werther, and Laetitia in Menotti's The Old Maid and the Thief. Ms. K. was also featured in several opera gala concert performances at the KBS Hall in Seoul, Korea as a member of the Kim Ja-Kyung opera company. Ms. K. was featured as a vocal soloist with the Washington Bach Consort for their 2013 season and is a professional member of the Washington Master Chorale and has appeared as a soloist in Washington-Baltimore area. Ellie was very kind, patient, and helpful. She quickly assessed my needs and was able to provide me with specific ways to improve my voice.